St. Dominic was born in what is now, Castile, Spain. The story is told that before his birth his mother dreamed that a dog leapt from her womb carrying a torch in its mouth, and “seemed to set the earth on fire”. This story may have been a vision of his order, as the Dominican Order in Latin is “Dominicanus” and by play on words was interpreted as “Domini Canis”, “Dog of the Lord”. His parents and a maternal uncle who was an archbishop brought up St. Dominic. Dominic was educated in the schools of Palencia, and later a university where he devoted six years to the arts and four to theology. At the same time, Spain was desolated by a season of famine, legend has it that he gave away his money and belongings, that he might relieve the distress of others. At the age of 25, Dominic joined the Canons Regular in the canonry of Osma, following the rule of St. Benedict. 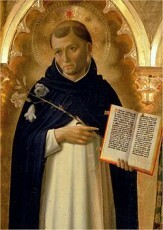 St. Dominic saw the need for a new type of organization to address the needs of his time, one that would bring the dedication and systematic education of the older monastic orders to bear on the religious problems of the burgeoning population of cities, but more organizational flexibility than monastic orders or the secular clergy. In 1215 Dominic established himself, with six followers, in a house given by Peter Seila, a rich resident of Toulouse. He subjected himself and his companions to the monastic rules of prayer and penance, and the bishop gave them written authority to preach throughout the territory of Toulouse. Dominic went to Rome to secure the approval of Pope Innocent III, and was finally granted written authority in December 1216. In 1217 he requested form the new Pope, Honorius III for the order to be named “The Order of Preachers”, or O.P., popularly known as the Dominican Order. Dominic made his headquarters at Rome, traveling often to maintain contact with his growing brotherhood of friars. It is said that Dominc abstained from meat, observed stated fasts and periods of silence, selected the worst accomodations and the meanest clothes, and never allowed himself the luxury of a bed. When traveling he began the journey with spiritual instructions and prayers. Dominic arrived in Bologna in December 1218. A convent was established at the Mascarella Church by the Blessed Reginald of Orleans. Dominic settled in this church and held the first two General Chapters of the Order. He became very sick while here, with a high fever. As he lay sick, and in that brief time that remianed, he spent reminding his followers to have “charity, guard their humility, and to make their treasure out of poverty”. He died there, at noon on August 6th, 1221. St. Dominic shows us that one person can make a difference. He identified the problems of his time, and made every effort to help change the situation. He even went so far as to start his own Order to meet those needs of his time that he felt weren’t being addressed. He also shows us that there is value in suffering. He went out of his way, to avoid things of comfort, so he could offer the suffering up. On his deathbed he reminded his followers of these things; be generous in charity, to guard their humility, and to make their treasures out of poverty. One doesn’t have to look to far to find these virtues being practiced today, as the Domininc Order is alive and well, growing in many places.